Remember the old adage, you are what you eat? Make it your motto. When you choose a variety of colorful fruits and veggies, whole grains, and lean proteins you’ll feel vibrant and healthy, inside and out. Live longer and stronger — Good nutrition keeps muscles, bones, organs, and other body parts strong for the long haul. Eating vitamin-rich food boosts immunity and fights illness-causing toxins. A proper diet reduces the risk of heart disease, stroke, high blood pressure, type-2 diabetes, bone loss, cancer, and anemia. Also, eating sensibly means consuming fewer calories and more nutrient-dense foods, keeping weight in check. Sharpen the mind — Key nutrients are essential for the brain to do its job. People who eat a selection of brightly colored fruit, leafy veggies, and fish and nuts packed with omega-3 fatty acids can improve focus and decrease their risk of Alzheimer’s disease. Feel better — Wholesome meals give you more energy and help you look better, resulting in a self-esteem boost. It’s all connected-when your body feels good you feel happier inside and out. Adults over 50 can feel better immediately and stay healthy for the future by choosing healthy foods. A balanced diet and physical activity contribute to a higher quality of life and enhanced independence as you age. Fruit — Focus on whole fruits rather than juices for more fiber and vitamins and aim for around 1 ½ to 2 servings each day. Break the apple and banana rut and go for color-rich pickings like berries or melons. Veggies — Color is your credo in this category. Choose antioxidant-rich dark, leafy greens, such as kale, spinach, and broccoli as well as orange and yellow vegetables, such as carrots, squash, and yams. Try for 2 to 2 ½ cups of veggies every day. Calcium — Maintaining bone health as you age depends on adequate calcium intake to prevent osteoporosis and bone fractures. Older adults need 1,200 mg of calcium a day through servings of milk, yogurt, or cheese. Non-dairy sources include tofu, broccoli, almonds, and kale. Grains — Be smart with your carbs and choose whole grains over processed white flour for more nutrients and more fiber. If you’re not sure, look for pasta, breads, and cereals that list “whole” in the ingredient list. Older adults need 6-7 ounces of grains each day (one ounce is about 1 slice of bread). 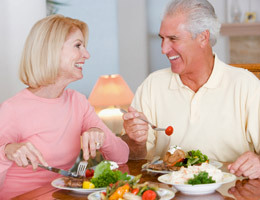 Protein — Adults over 50 need about 1 to 1.5 grams per kilogram (2.2lbs) of bodyweight. This translates to 68 to 102g of protein per day for a person weighing 150 lbs. Divide your protein intake among meals but aim for 25 to 40g of high-quality protein per meal; less than 15g won’t benefit bone or muscle. Vary your sources instead of relying on red meat, including more fish, beans, peas, nuts, eggs, milk, cheese, and seeds in your diet. Water — As we age, some of us are prone to dehydration because our bodies lose some of the ability to regulate fluid levels and our sense of thirst is may not be as sharp. Post a note in your kitchen reminding you to sip water every hour and with meals to avoid urinary tract infections, constipation, and even confusion. Vitamin B — After 50, your stomach produces less gastric acid making it difficult to absorb vitamin B-12-needed to help keep blood and nerves vital. Get the recommended daily intake (2.4 mcg) of B12 from fortified foods or a vitamin supplement. Vitamin D — We get most of our vitamin D intake-essential to absorbing calcium and boosting muscles-through sun exposure and certain foods (fatty fish, egg yolk, and fortified milk). With age, our skin is less efficient at synthesizing vitamin D, so consult your doctor about supplementing your diet with fortified foods or a multivitamin, especially if you’re obese or have limited sun exposure. Add fiber. Avoid constipation, lower your risk of heart disease, stroke, and diabetes, maintain a healthy weight, and feel fuller longer by increasing your fiber intake from foods such as fruits and veggies, whole-grains, nuts, and beans. Women over 50 should aim to eat at least 21 grams of fiber per day, men at least 30 grams. Avoid “bad” carbs. Bad carbohydrates-also known as simple or unhealthy carbs-are foods such as white flour, refined sugar, and white rice that have been stripped of all bran, fiber, and nutrients. Bad carbs digest quickly and cause spikes in blood sugar levels and short-lived energy. For long-lasting energy and stable insulin levels, choose “good” or complex carbs such as whole grains, beans, fruits, and vegetables. Look for hidden sugar. Added sugar can be hidden in foods such as bread, canned soups and vegetables, pasta sauce, instant mashed potatoes, frozen dinners, fast food, and ketchup. Check food labels for other terms for sugar such as corn syrup, molasses, brown rice syrup, cane juice, fructose, sucrose, dextrose, or maltose. Opt for fresh or frozen vegetables instead of canned goods, and choose low-carb or sugar-freeversions of products such as tortillas, bread, pasta, and ice cream. Cook smart. The best way to prepare veggies is by steaming or sautéing in olive oil-it preserves nutrients. Forget boiling-it drains nutrients. Weakened senses. Your taste and smell senses diminish with age. Older adults tend to lose sensitivity to salty and bitter tastes first, so you may be inclined to salt your food more heavily than before-even though older adults need less salt than younger people. Use herbs, spices, and healthy oils-like olive oil-to season food instead of salt. Similarly, older adults tend to retain the ability to distinguish sweet tastes the longest, leading some to overindulge in sugary foods and snacks. Instead of adding sugar, try increasing sweetness to meals by using naturally sweet food such as fruit, peppers, or yams. Avoid skipping meals — This causes your metabolism to slow down, which leads to feeling sluggish and making poorer choices later in the day. Breakfast — Select high-fiber breads and cereals, colorful fruit, and protein to fill you with energy for the day. Try yogurt with muesli and berries, a veggie-packed omelet, peanut-butter on whole grain toast with a citrus salad, or old-fashioned oatmeal made with dried cherries, walnuts, and honey. Lunch — Keep your body fueled for the afternoon with a variety of whole-grain breads, lean protein, and fiber. Try a veggie quesadilla on a whole-wheat tortilla, veggie stew with whole-wheat noodles, or a quinoa salad with roasted peppers and mozzarella cheese. Dinner — End the day on a wholesome note. Try warm salads of roasted veggies and a side of crusty brown bread and cheese, grilled salmon with spicy salsa, or whole-wheat pasta with asparagus and shrimp. Opt for sweet potatoes instead of white potatoes and grilled meat instead of fried. Snacks — It’s okay, even recommended, to snack. But make sure you make it count by choosing high-fiber snacks to healthfully tide you over to your next meal. Choose almonds and raisins instead of chips, and fruit instead of sweets. Other smart snacks include yogurt, cottage cheese, apples and peanut butter, and veggies and hummus. Senior meal programs are a great way to meet others.Contact your local Senior Center, YMCA, congregation, or high school and ask about senior meal programs. First, check with your doctor to see if your loss of appetite could be due to medication you’re taking, and whether the medication or dosage can be changed. Try natural flavor enhancers such as olive oil, vinegar, garlic, onions, ginger, and spices to boost your appetite. Drink 8 — 10 glasses of water each day. Take a drink of water after each bite of food, add sauces and salsas to your food to moisten it, avoid commercial mouthwash, and ask your doctor about artificial saliva products. Focus on how you feel after eating well-this will help foster new habits and tastes. The more healthy food you eat, the better you’ll feel afterwards.